Previously this season there was a dusting, then about 2" fell on Sunday, December 4th, but on Friday, December 9th the area received its first snow. About 6 to 8 inches blanketed the area in a fast moving storm during the morning hours and ending about noon. The Hasbrouck Heights Board of Education canceled school. About 1.5 inches accumulated hourly during the morning rush hour. The Department of Public Works was ready with all plows and salt spreaders loaded Thursday evening. The town was set up into four sections: two-truck teams with plows and spreaders covering the north, central and south sections. The roads on the hill from Terrace to Rt. 17 were handled by front end loaders. Smaller "masons style" dump trucks took care of Borough property, cul-de-sacs and dead end streets. The curb-to-curb plowing service was accomplished in part by the no on-street parking from 2 a.m. to 6 a.m. rule. By noon, the sun was shining and the roads were plowed clear. Snow removal began on Friday night with the schools and churches being done first, followed by the sidewalks and curbs along The Boulevard Business District. The cost related to this snow clean-up for the Borough was estimated to be $13,200 and included overtime, fuel, salt usage, etc. Costs included clearing during the storm as well as cleaning The Boulevard and school crossings which weredone Friday and Saturday nights. 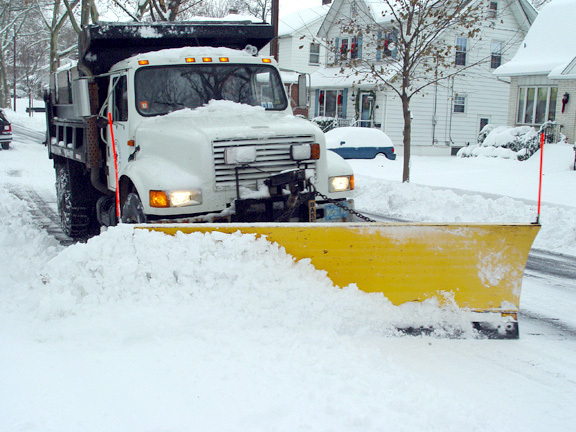 The county will reimburse Hasbrouck Heights $320 for plowing county roads. State DOT officials estimated that clearing the roads costs about $4 million in materials, salaries and contractor payments this snowfall. The DOTs snow budget is about $11.3 million. The average seasonal snowfall for our area is about 30 inches and the average December snowfall is 4 inches. According to the the online version of the almanac, snowfall will be much greater than normal this season with the biggest snowfalls in early December and the second half of January. The DPW reminds residents not to throw their snow into the streets thinking that the traffic will dissipate the snow. Actually, the snow often re-freezes causing hazardous driving conditions. The DPW also asks that residents not park in the streets until the plowing has been completed. Keeping the streets clear facilitates the DPW to provide curb to curb snowplowing service. Residents and businesses are reminded that they are responsible for clearing their sidewalks within 24 hours after the snow stops.